Not many Metal bands can afford to take 5 years between albums and in the process lose both guitar players who are also founding members of the band. Not only is it virtually impossible to survive but to be expected to stay relevant and to put out a quality release on top of it all. That is what Finland’s MORS PRINCIPIUM EST is trying to accomplish with their latest release through Germany’s AFM Records “…And Death Said Live”. Staying true to their melodic Death Metal roots their newest album shares more in common with SKYFIRE, KALMAH and DARK TRANQUILLITY than with Metal titans as IN FLAMES and modern day SOILWORK. “The Chainheart Machine” era of SOILWORK is a great blueprint for “…And Death Said Live” though. The one aspect that separates MORS PRINCIPIUM EST from the majority of melodic Death Metal of today is their decision to not use any clean vocals on this record. Most melodic Death Metal nowadays has the gruff verses with the huge and predictable melodically sung chorus. All of the melody comes from Andy and Andhe. Their guitar playing is top notch and I think they do an astonishing job of stepping up. Their leads are incredibly fast and precise. They really shine and make you take notice on “Dead Winds Of Hope”, “I Will Return” and “Bringer Of Light”. Ville Viljanen’s vocal performance is also another highlight. His rasp is done flawlessly and is never over the top or too brutal. The final track on the record “Dead Winds Of Hope” stands out as vocalist Viljanen’s best performance. He is at his most guttural at the 3:30 mark and sounds like he is ready to tear someone’s head off. Another highlight for Ville is the way he spews out his rasp but still makes the songs memorable and appealing. The songs get a tad monotonous from time to time but that is to be expected when you don’t have melodic vocals. One of the most brilliant tracks is the title track “…And Death Said Live”. Placed about half way through the record it is perfect break from the hammering you have been given up until this point. It is a brief 2-minute instrumental that incorporates a beautiful arpeggio Piano line as its backbone with a guitar solo that sounds like something TESTAMENT’sAlex Skolnick composed. It is an important part of the record as it separates a little of the repetitiveness that the record suffers from. 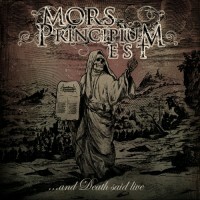 MORS PRINCIPIUM EST have really made a statement with their latest release in that they can rise from the departure of 2 key members and reform itself better than ever. Again, the most memorable part of the record is Andy Gillion and Andhe Chandler’s guitar playing. It sounds like they have been a part of this line-up for years. Over time I can only imagine what improvements will happen with the chemistry and interaction of the band. The sky is the limit for MORS PRINCIPIUM EST and if you like you’re melodic Death Metal a little more brutal with no clean vocals then look no further.